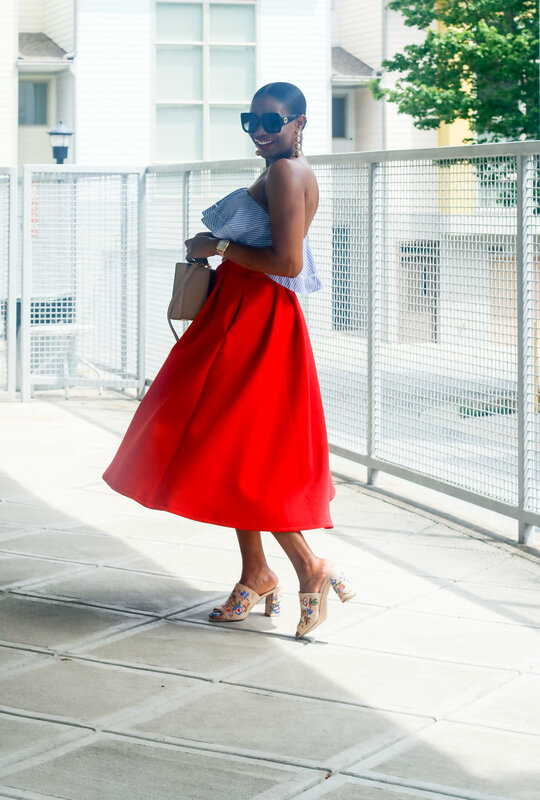 Hey Style Lovers, happy Wednesday. It has literally rained every day thus far this week. Thankfully I have no outfits to shoot, nor do I have any events to attend, so I actually don’t mind the rain as much. The rain has actually forced me to stay indoors, and work on getting better organize. Running my own business has proven to be a bit of a challenge in terms of getting organized. I write things down, but sticking to my schedule can be a little hard when you receive emails, and comments on social media, at all times of the day. Being organized while working in social media is definitely hard but he can be done. With the 4th, of July, less than two weeks from now, I decided to create an outfit that would be perfect for the holiday. 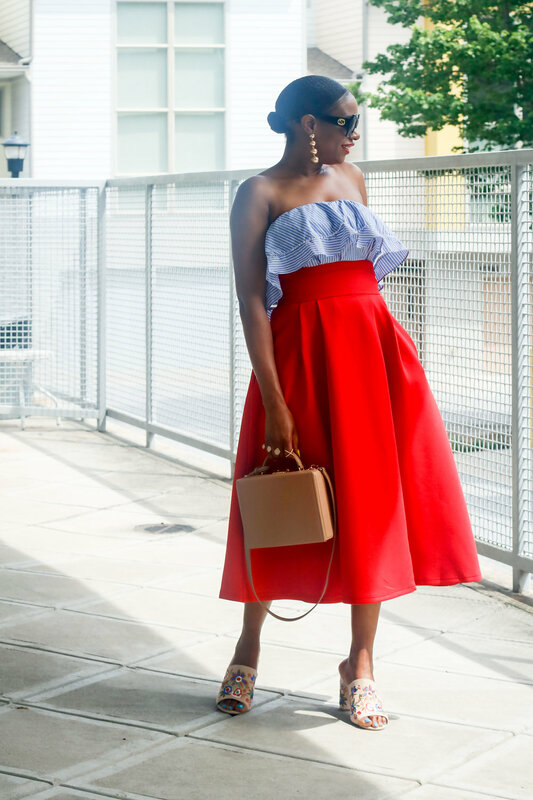 For my 4th, of July outfit I wanted to create a look that celebrated the day without being obnoxious. 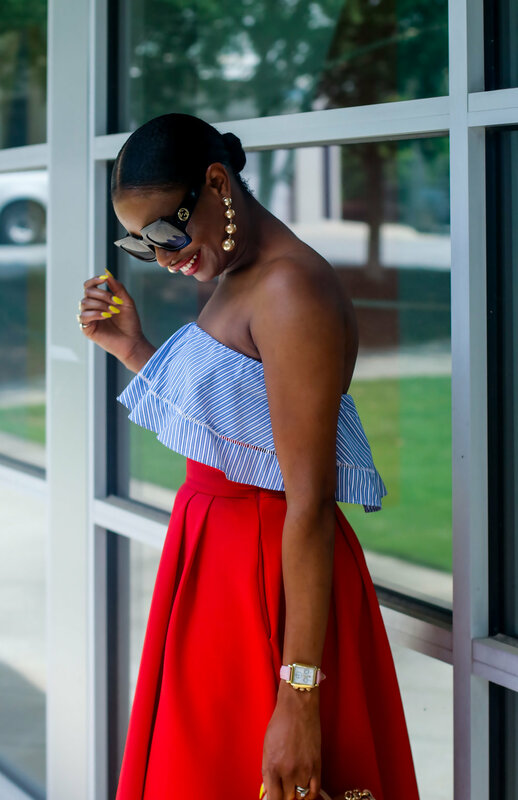 For this outfit I utilized the red, white, and blue theme of the 4th, of July, and also included floral print to add a bit of a summer flare to the look. 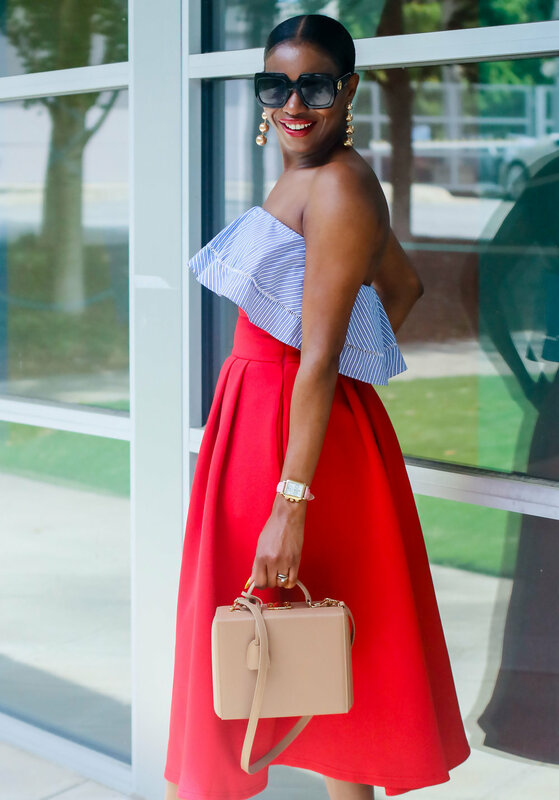 My blue and white striped off the shoulder blouse, pairs perfectly with the vibrant red high-waist midi skirt. 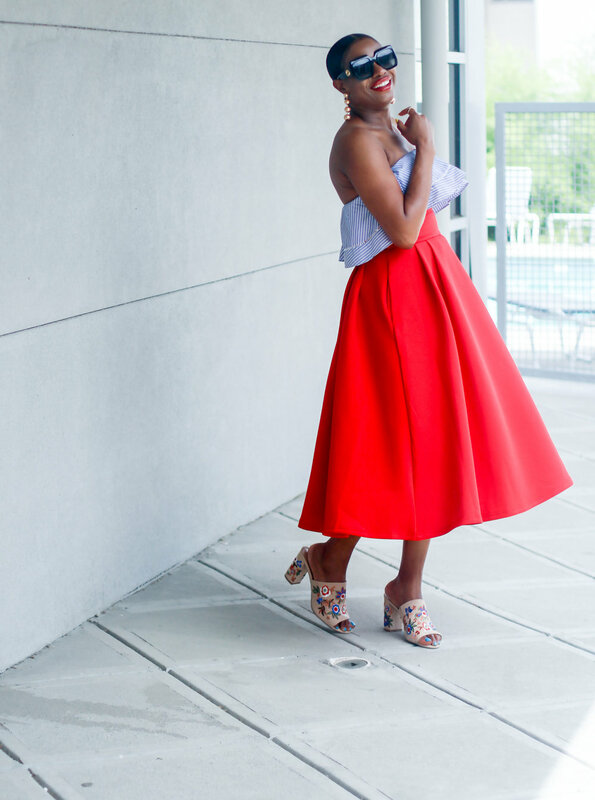 The rich hue of the skirt is absolutely stunning, while the fullness of the skirt makes it fun, flirty, and perfect for summer. The red and blue floral details found on my mules do a great job of bringing all the colors together. I also used the beige hue on the shoes to couple my bag to the look. 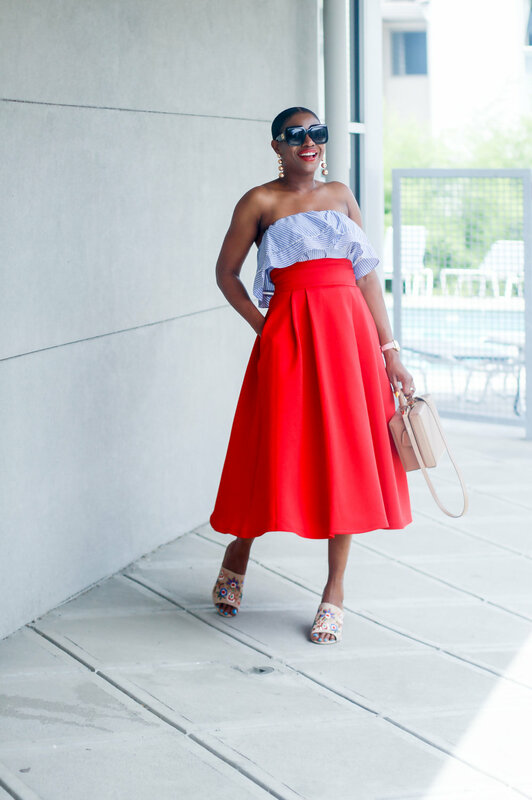 A pair of oversize sunglasses and gold statement earrings complete this outfit. 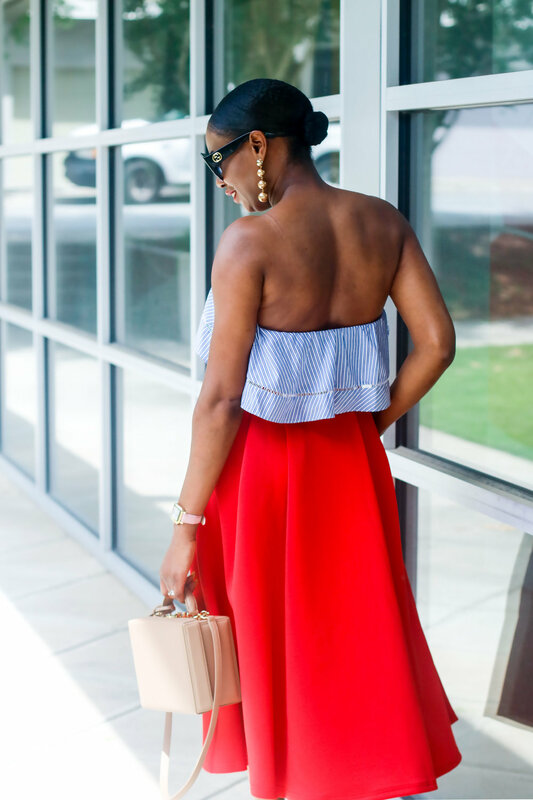 All the details together create a look that is stylish, and celebrates red, white and blue. I hope you guys love this look as much as I do! 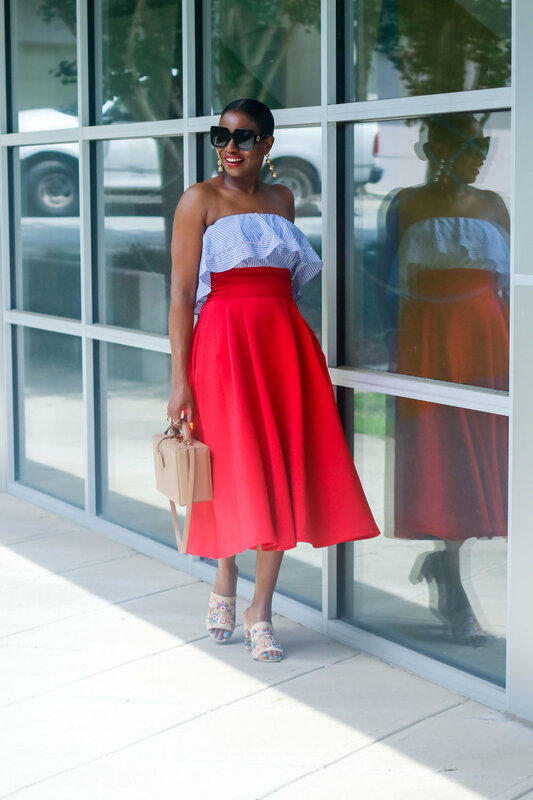 Don’t forget to use the links to shop the post, and use this outfit has inspiration when planning what’s to buy, or what to wear for Independence Day. Have an awesome Wednesday lovelies.